My home port has lost the plot. This week I received an email from the Port of Brisbane Corporation(a Queensland Govt owned entity) advising me that they were increasing port and wharfage charges by 6% on all cargo except for coal which cops an 11.1% hike as of the 1st of December. Supposedly this is to keep pace with capital expenditure on port development. This increase announcement comes at a time when many port users are struggling with the impacts of the GFC and cannot afford any cost increases whatsoever. KPMG has apparently undertaken a study on the impact of the increase. Well...we are probably the largest freight forwarder of heavy equipment through the port and I didn't hear from them. Can the Port of Brisbane(POB) be serious with this increase?! This directly impacts our exporters and makes them less competitive..and I would have hoped that goverments at all levels would be doing everything in their power to help them. A high school economics student could tell you that exports bring money back into the country. Hold on..don't we have a MASSIVE national debt from stimulus packages of $300bn + and climbing? What the hell is going on and when is the QLD Govt and it's various entities going to stop trying to milk coal dry with charges and royalties?! Enough! Coal is one of our biggest exports!! Supporting trade 100% should be a priority..shouldn't it? The Port's annual report for 08/09 is yet to be released but I can tell you that 07/08 was a good year delivering a net profit after tax of $438.7m. A dividend was declared and the QLD Govt received $205.7m for this year. Not bad and looking at cargo volumes for 08/09, while smaller, it still should be a decent year. Coincidentally....perhaps....the QLD government is in the process of selling off the Port of Brisbane. Maybe the real agenda of increasing costs is not to further develop the port but to make the books look as good as possible for the buyers they hope to attract. Sound corporate governance if you are selling a company, however shouldn't a goverment owned entity charged with the responsibility of key port infrastructure have some responsibility and conscience to support shippers by keeping costs to a minimum? I don't care when the last increase was or what the CPI is....a govt owned port entity should be supporting trade as it's primary objective not taking decisions driving a sale outcome. This doesn't mean I think any operation should lose money. A break even with lower port costs for users should be the goal. Over and out! Some ports around the world recognise the distress the shipping industry is in and are reducing costs. It has been reported by various shipping media outlets that ports such as Singapore, Dubai and Karachi are reducing their costs to help the port users navigate the GFC. Shouldn't we be doing the same at this time? On top of this my heavy equipment customers and ship operators are frequently frustrated by delays to vessels and increased costs caused by congestion at berths 3 and 4 in particular. Then they are forced to deal with the POB appointed stevedore Australian Amalgamated Terminals Pty Ltd which is a JV between DP World (formerly P&O) and Toll/Patrick. AAT is under investigation by the Australian Competition & Consumer Commission for various issues that may restrict dealings and competition. I fail to see where the competition is in stevedoring with the two big boys of the Australian waterfront in a partnership in AAT. At AAT you basically have to self deliver your own cargo. What happened to having wharfies sort, stack and deliver cargo to road transport companies? It's all gone too far. I won't even open the port motorway discussion except to say there was another fatality on that road a week ago. A road my team travels daily. Much needed upgrades have been deferred and deferred by the QLD Government and it isn't coping. How many more fatalities will it take for work to start? With the impending sale of the Port of Brisbane I hope that once privatised, we will see a tremendous improvement in the operation of the port. I know that my customers and I and other port users are frustrated and increases in costs during a global credit crunch only add insult to injury and clearly signals to me that urgent change is now a necessity! Bring it on. All for now and for the international readers of my blog.....forgive me for the local indulgence. 95 years of the Panama Canal. The 15th of August saw the Panama Canal hit it's 95th anniversary of operations. During this time about 983,000 ships have passed through it safely and it has been instrumental in the development of Panama itself. Tolls are levied on the ships according to their net tonnage and type. So for a RoRo ship like Wallenius Wilhelmsen's, "Tampa", that has a net tonnage of 26,072, the toll applied per transit is about US$99187.00. For containerships the rate applied by the authority is US$72.00 per 20' container the vessel is carrying. See where some of the money goes in the freight rates you pay? Right now the Panama Canal Authority(ACP) is undertaking a US$5 billion expansion so it can cater for the new larger vessels and increased traffic that cannot currently pass through it. It's fascinating watching vessels go through the canal. The ACP operates live webcams so you can tune in and see ships transitting through. Check it out. Alternatively for a time lapse ride on a cruise ship please click here. The Panama Canal is a vital link in global shipping reducing transit times and operating expenses for vessel owners and I am certain will remain as important as ever for another 95 years. We were loading a ship off the coast of Western Australia last week when these guys swam over to say "G'day". They didn't seem worried at all about the activity on board the vessel. If you'd like to see more images, then go to my company's Facebook page. 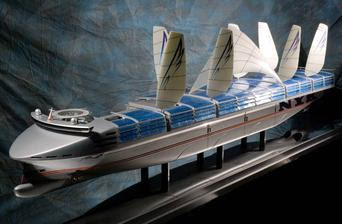 Shipping capacity will soon exceed demand by 50%! The outlook for shipping lines is still extremely grim. The European Community Shipowners Association has called for an urgent industry wide ship scrappage scheme to shrink the massive surplus of vessels. They have warned of an impending bloodbath as they estimate that shipping capacity will soon exceed market needs by between 50-70% as demand continues to fall in line with global consumption. Chang Yung Fa, the CEO of Evergreen, described the excess as "gruesome". Hapag Lloyd have been thrown a lifeline of US$467m by their shareholders and so has Zim who were struggling to pay for new vessels due out of the shipyards that they ordered well before the GFC gained momentum. Other carriers are trying to do rights issues to get the cash/oxygen they need to survive the downturn while at the same time banks are increasing the loan to valuation ratios they work on with ships. To reduce costs some carriers are "slow steaming" to conserve fuel and travelling via the Cape of Good Hope rather than pay the expensive Suez Canal fees. You would think that this carnage would translate into lower freight rates however the opposite is ocurring in the break bulk and container trades as carriers fight for survival. 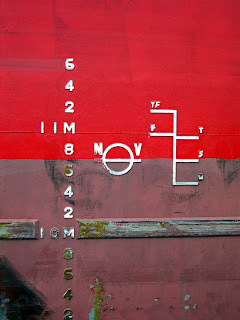 Rates and fuel surcharges are being increased or "restored" to use the shipping lines language. As you can see I refer to some of the worlds MEGA shipping lines in this blog. What the....? Isn't bigger supposed to be better? So what is the future of the MEGA carrier? More on that soon in a future blog. **All amounts converted to US$ at todays exchange rates and rounded to the nearest million dollars. So what if deck cargo is cheaper? Cargo integrity is my absolute priority. That's why I rarely, if EVER, load heavy machinery on the deck of vessels. It is absolute last resort. There literally has to be no other way to get the cargo to that destination before I will even vaguely consider it. Even then, I do my level best to make my client completely aware of the risks, accept them, notify their underwriters and protect the cargo as much as possible. I have frequently lost business to competitors who come in cheaper because they are taking that risk with clients cargo. Worse still sometimes they don't even tell the client they are putting the cargo on deck and profiteer. I'd rather not handle the shipment than risk damaging the cargo and my relationship with my customer with it. It's not that risky you say.... and if you can save a few bucks then....why not? Check these links out and then answer that question. If waves can come over the deck of the "USS Kitty Hawk" 102 feet from the water line then.... Game over. The current liability regimes governing international shipping look set to change to a new convention called the "Rotterdam Rules". The UN General assembly has adopted these and put them up for signing in Rotterdam on the 23rd of September. For these to come into force at least twenty countries must sign the convention and this looks likely to occur. The Rotterdam Rules are intended to modernise, harmonise and replace a multitude of other liability rules governing shipping globally dating back about century or more. These include the Hamburg, Hague and Hague Visby Rules and other regional rules such as the United States and Australian COGSA, the Nordic States Maritime Code and the Maritime Code of China. The humble bill of lading looks like being replaced with a "NTD". A Negotiable Transport Document. Controversially and unlike a bill of lading, an NTD enables a shipping line or freight forwarder to release the goods to a third party without that party having to be the holder of the NTD. A bill of lading is a document of title to the goods so without this status, there is a likelihood that NTD's may lead to a lack of security in the global banking system and with letters of credit. We'll see. The Rotterdam Rules attempt to cover e-commerce far more comprehensively than the current rules. I see this as an imperative although some confusion will no doubt follow for a while. The good news for shippers and consignees is that the carriers limit of liability will be increased. You'll still need comprehensive marine insurance cover but this is a step in the right direction. More on the Rotterdam Rules....click here. Freight rates are on the up. In a previous blog I explained that I didn't believe that the shipping lines low freight rates combined with decreased cargo volumes in many trade lanes were sustainable. I have been watching with interest the publicly listed shipping lines report their quarterly results to the stock market and it's giving an insight into just how severely some of them have been affected. Some have suffered spectacular record losses and others falls in profit of 80% or more as a result of the downturn. Rates and cargo volumes have been down to such an extent that it has threatened the viability of many carriers. Financial defaults are growing. Last month the "Gem of Madras" was arrested in the USA as her owners had fallen behind in their loan repayments to the Nordea Bank. "Rate restoration, GRI(general rate increase) and peak season/fuel surcharges" are the language the carriers are using again. The container operators have started lifting rates from between US$100 to US$300 per TEU(twenty foot equivalent unit) as of the 1 July in various trade lanes. The rules of supply and demand are being leveraged. Higher demand has been created as numerous ships have been taken out of service and are currently idle. The vessels that have remained operating are starting to achieve higher utilisations and thus higher rates can be asked by the lines. Here is a link to a BBC story on ships currently rafted up in the UK. I think the big question is whether or not there is a second or even third wave of the GFC coming due to decreases in consumption from growing unemployment and continued pressure on credit markets and on top of that, government stimulus actions being wound down. One thing is for certain. Freight rates are starting to head north again...as they must... if we are going to be left with decent shipping services around the world. Salvage of the "Cougar Ace" may become a Spielberg movie. I read Wired Magazine from time to time and I was enthralled by the story of the “Cougar Ace” they published in March this year. In February 2008 the “Cougar Ace”, owned by Mitsui OSK Lines, rolled over in Wide Bay, Alaska, with 4703 Mazda cars on board. Titan Salvage were called in to save the ship and it’s cargo. The success fee paid by the underwriters for this risky and dangerous job....US$10 million. 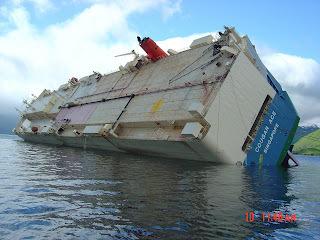 The ship and her cargo were ultimately saved however the life of a member of the salvage team was lost in the process. As for the cars...UKP55m worth... Mazda had them destroyed in a shredder as they couldn’t guarantee that they wouldn’t be without problems due to what they endured. Rather than retell the whole story, here are the links so you can read the fantastic Wired article or watch a 3min 49 sec video. It's worth the short time investment to take a look. This is one of the most amazing and thrilling salvages of a vessel at sea that I have ever heard. I can see why Steven Spielberg’s ,Dreamworks, bought the option to turn the story into a movie. According to certain climate models the whole Arctic Ocean is said to become progressively ice free by the middle of this century. Some models indicate this will happen even sooner than that. So what will this mean for shipping routes, transit times and freight rates and the Panama and Suez Canals as major passages now? The Danish Institute of International Studies has recently completed some research on this question and here are some of the findings. 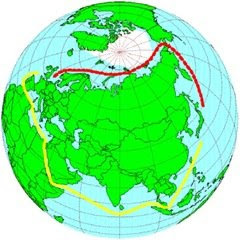 Of 130 shipping companies surveyed most say that these northern sea routes(red line) are too risky for their vessels and insurance premiums are currently very high. Even if the icecaps shrink further the fact is drift ice and icebergs will still be a threat to shipping for many years yet and some types of cargo are not able to go through areas of extreme cold. Although the distances between some ports is shorter, the ships speeds would have to be reduced. So it is debatable whether this will translate into operational efficiency gains. Torm Lines calculated in early 2008 that travelling between Europe and Asia by northern sea routes would mean savings to them of about 12 days sailing time and operating costs per voyage of about US$155,000.00. And....they have started investing in more iceclass vessels. Many shipyards order books for ice strengthened vessels are growing so perhaps some other operators believe this will become commercially feasible for them soon too. Four North American and two European shipping lines are already using Arctic routes so it is clearly possible. So... is global warming a reality and will this route open up completely to heavy transit shipping or is the icecap shrinkage only temporary? It seems the shipping industry is just as conflicted on this issue as the scientific community. Time will tell.